Driving south along Jefferson Road in the Downriver region of Southeast Michigan, you pass a Detroit Edison plant with its towering twin smoke stacks and then the Monsanto chemical company and finally the remains of what was once McLoud Steel. Maybe that's what makes Pointe Mouillee State Game Area so unique. Within minutes in the rustbelt that is Downriver you travel from power plant and industrial complex to one of the most extensive marshes in Michigan. 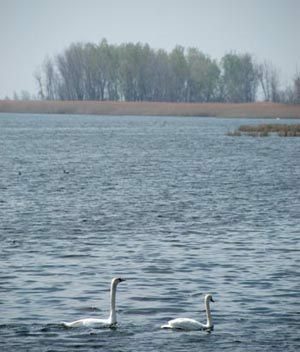 Located near the towns of Rockwood and Gibraltar, the state game area is 4,000 acres of marshes, pools and diked ponds surrounding the mouth of the Huron River and the shoreline of Lake Erie. Historically it was much larger, so large that it's abundance of wildlife and waterfowl induced Late Woodland Indians to settle the area and then attracted French fur traders in the 1700s who gave the marsh its name of Pointe Mouillee (pronounced “Point Moo-yay”) or "wet point." In 1875, eight millionaire sportsmen purchased the area and formed the Big 8 Shooting Club, which four years later became the Point Mouillee Shooting Club, one of the oldest in the state. 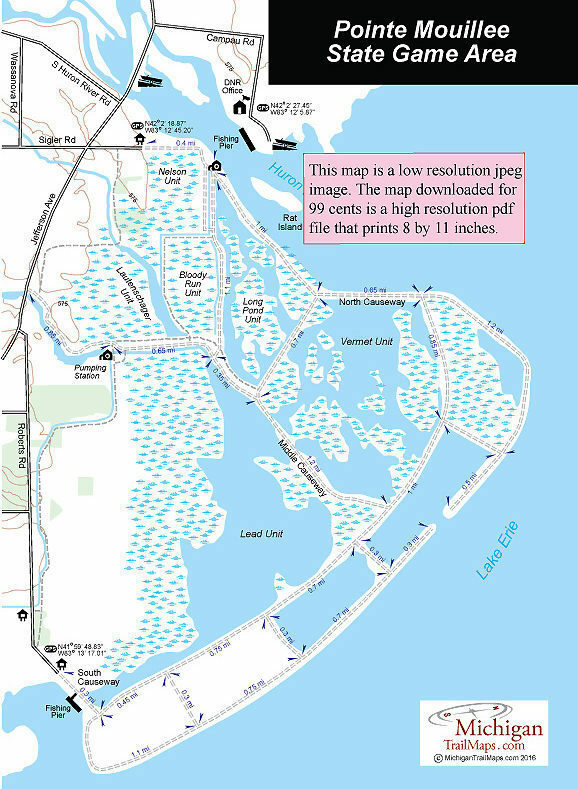 Eventually the fluctuating water levels of Lake Erie eroded the protective barrier island and the wetlands began to diminish, setting the stage for one of the largest fresh water marsh restoration projects in the world. The result of this gigantic earth-moving and dike-building project is a regenerated marsh with thriving wetlands, marshes, and river bayous. Most of the dikes make excellent trails for hiking and easy mountain biking, with some resembling wide, gravel two-tracks. The two routes covered here are the Middle Causeway Loop, ideal for hiking, and the Perimeter Dikes better suited for mountain bikes due to it 9.8-mile length. The main attraction of Pointe Mouille, whether you’re walking or biking, are the birds. 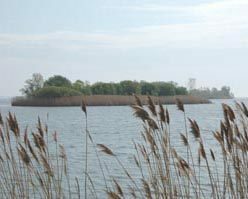 This area provides some of the best shorebird viewing in the state, especially in late summer and early fall as well waterfowl, wading birds, and birds-of-prey. Other animals from muskrats and snakes, sunning themselves on the dikes to spawning carp, can also be seen. On the first weekend after Labor Day every year, the Pointe Mouillee Waterfowl Festival Committee puts on their annual waterfowl festival at the Pointe Mouillee State Game Area. When hiking or biking the state game area keep in mind that there is little shade along the dikes so sun screen, wide-brimmed hat and drinking water are necessary for longer outings. A stiff breeze is also common, being on the edge of Lake Erie, keeping the bugs at bay but chilling those who come to lightly dressed. At the state game area headquarters, reached from Campau Road, there is a boat launch, historical display and a long fishing pier along the breakwall where anglers gather to fish the mouth of the Huron River. Along a Jefferson Avenue on the north side of the Huron River is Brownstown Township's delightful Riverfront Park, featuring a boardwalk and benches overlooking the river. There is also a boat launch and a fishing pier along the South Causeway, reached at the end of Roberts Road. Pointe Mouillee is open to non-hunters year round except during hunting seasons for snipe, rails, ducks, mergansers, coots, and moorhens. The seasons, often referred to as the "no birders allowed" period is September 15 through the end of November plus the first weekend in January. The rest of the time the area is open to non-hunters and hunters. The last legal day for small game hunting is March 31 and after that you will not see to much, if any, blaze orange. The state game area headquarters is open only on Monday and Wednesday from 8 a.m. to 4:30 p.m. There are no vehicle or entry fees to visit the state game area. From I-75, depart at exit 27 and east on North Huron River Road for two miles. Turn south on Jefferson Road and in 1.5 miles turn east on Campau Road and follow the signs to reach the headquarters. There are three main trailheads or access points into the state game area. The middle Causeway Loop is reached from the Sigler Road entrance. Continue south from Campau Road and Jefferson turns into Dixie Highway and crosses the Huron River. Just beyond it is Sigler Road where you turn east (left) and follow it to the end to the parking area. The Mouillee Creek trailhead and parking area is another 1.2 miles south of the Huron River on Dixie Highway. Perhaps the most popular access point into the state game area is the end of Roberts Road. The dirt road is 1.5 miles south of the Huron River where it heads due south from Dixie Highway and ends at a parking area in 2 miles. 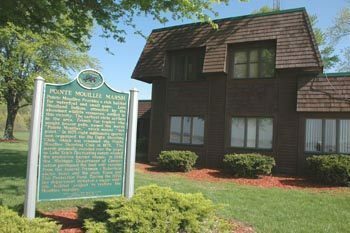 Call or stop at the Point Mouillee State Game Area Headquarters (734-379-9692; 37205 Mouillee Rd, Rockwood) reached from Campau Road off of Jefferson Avenue.